For years we have been advising DNA testers, specifically those searching for birth family and attempting to solve family mysteries, to test at all three of the major DNA testing companies, in other words to “fish in all three ponds.” These three autosomal DNA databases – AncestryDNA, 23andMe and FamilyTree DNA - now contain between about five to six million testers in total. For another company to be able to compete in this space, they must offer a test comparable in resolution and features, and be prepared to tackle the challenging proposition of “catching up” with the databases of the other three companies. That is a tall order and, so far, there have been no other companies to earn our recommendation. With that said, I believe the time has come that we must consider revising our advice to include a fourth “pond,” MyHeritage DNA. When a genealogist or person of unknown parentage is seeking to answer a specific question about their ancestors, near or far, the chance of success, at least, partially relies on luck. Who else has tested at the same company? For unknown parentage this is especially true. For example, an adoptee may test at only one company, while the birth parent or sibling is tested at another. If the attempt to search goes no further, then there will be no successful outcome. Since all of these databases are proprietary and only a relatively small percentage upload to the third party comparison site Gedmatch, it is essential for those engaged in unresolved searches to make sure the DNA is submitted to all databases where there may be a unique match. Recently, MyHeritage launched their DNA matching service. For most of us, it may be easy to ignore them for now while they work out their questionable matching algorithms and grow their database to a size that earns our interest, but for those of unknown parentage or for birth parents who have yet to find success in their searches, it may not be prudent to do so. In the last couple of weeks, I have been made aware of several unknown parentage cases that were resolved through MyHeritage DNA. These searchers had made sure that their DNA was “fishing in all three of the ponds,” plus Gedmatch, and yet had not found the answers they were seeking in any of those databases. Since MyHeritage offers a free upload of the raw data files from the other three DNA testing companies, this has encouraged some in my DNA Detectives Facebook group to try it out. Well, it turns out that MyHeritage is having success at attracting its own unique group of testers who are not at the other three companies. Lo and behold, for some, what they have been looking for is in that database and nowhere else. Since it is, undoubtedly, still the smallest database, the odds of finding a close match are presently low, but they are clearly not zero. Consider these three recent MyHeritage DNA success stories. The father was my first love, high school sweetheart. He was three years older. We had talked about getting married but something happened…he turned and suddenly didn’t want anything to do with me. I was devastated and distraught. I gave my daughter up through the LDS Social Services in a closed adoption. At the time they did not do adoptions with pictures or information given to the birth parent after the birth. I had told my counselor that someday I wanted to meet her. I had tried everything to try and find her. I had always thought she was adopted in California. It wasn’t but about 20 years ago that I found out it was actually in Davis County, Utah. I had been looking in the wrong place. I tried to register in the Utah adoption registry, but they wouldn’t let me because the birth had to be in that state. I tried to register in the Hawaii adoption registry, but they wouldn’t let me because the adoption had to be there. The birth was in Hawaii and adoption in Utah -- just opposite from their rules. I tried to send for the amended birth certificate hoping someone would screw-up and send it to me. I got the original one…. I tried talking with people in Hawaii. I tried talking with people in Utah. I tried writing the court to tell them I had cancer in 2003 and it was imperative that I get a hold of her to let her know the medical history. They never wrote me back… I even had a friend attorney try to find a loophole the in Hawaii law code that would permit me to have the records open. No luck, nothing. I was pretty discouraged. My mother passed in 2001 and I had always wanted her to meet my daughter but it didn’t happen. I even would say, ”Mom, I know you know who she is now and please just whisper her name in my ear.” If I had a name I knew the chances of finding her were pretty good. My husband and I also wanted to do our DNA even though we had a fairly good idea of our roots and where we were from. For Christmas 2016 we decided to both do our DNA through AncestryDNA. My friend Jennifer was helping me… and in the process I told her my story about having a child at 15 and giving her up for adoption. She said, “You have to meet my sister-in-law! !” Her sister-in-law Mckell, came over to my house and told me how she helps people find people. She told me that I have to upload my DNA data with other sites. I was a little skeptical at first because that was really putting myself out there, but, oh well, the government knows everything about us anyway, what the heck! She had me go on this site and that site and to MyHeritage. This was in January 2017. I was grateful to her but really didn’t think about it much after that day. Every now and then I would get an email from the sites saying they found my 14th cousin….ok, that’s an exaggeration but you get what I mean. No big deal, right. Good news! We’ve discovered new DNA Matches for you. I quickly called Jennifer, she didn’t answer so I texted her: "MyHeritage…..Daughter….call me ASAP!" She called Mckell and Mckell called me all calm like. I told her and she said, "Robin, that is HER!" I kept questioning because I just couldn’t believe it. The next two hours Mckell and I were on the phone trying to find out everything I could about Becky. I still couldn’t find her birthday. That was the one piece that would cinch this whole puzzle for me to really know if it was her. "Hi Becky my name is Robin … and I live in Mesa, AZ. My Heritage DNA messaged me yesterday and if you are who I think you are, I have been looking for you practically my whole life. When is your birthday? Please call me 480 -…"
Me: Yes I gave birth to a daughter January 10, 19xx [removed for privacy] in Queens Hospital in Honolulu Hawaii. I was 15 yrs old. Her: (Big smiley face) OMGoodness!!! WOW!!! Yes, it’s me (cheezy grin) Forgive me, I’m kind of in shock. Can we text for a bit before we talk? We continued to talk back and forth until she had to go get ready for work. I told her we have seven children and that she has five sisters and two brothers. She was blown away, but in a good way. She was so excited to have sisters. She always wanted a big family. I told her we have 30 in our family -- and that is just my husband and I, our kids, their spouses, and grandchildren. Becky had done her DNA through MyHeritage to find out her roots….she got a lot more than she bargained for. So much more happened…. Then we met….that’s another story…. Robin's daughter Becky had only tested at one DNA company. Unlike a person of unknown parentage searching for their birth parents, when a birth parent is searching for their biological child, it is like searching for a needle in a haystack. This is because that one person (or their descendants) has to have also taken a DNA test. Very importantly, they must be in the same database. In this case, if Robin had only submitted her DNA to one, two or three of the DNA testing companies, and if Mckell had not encouraged Robin to upload to MyHeritage, she would not be reunited with her daughter today. Well thanks to you and a 20/20 piece you did, I took my first DNA test with AncestryDNA last year. (My husband did as well and found his birth father!) I was trying to uncover my mother’s true origins. The story I had heard was that my mom's birthmother had my mom and went away with her. She then came back to the birth father’s house and dropped her off to never be seen again. In the end, my mom was raised by neither birth parent and ended up being adopted by someone else. I took all available tests out there and transferred my raw DNA data to all sites that were free. My best match was a 4th cousin on AncestryDNA. About two weeks ago I get an email from MyHeritage about a match with 870.8 cM shared and, at the same time, I got a match on AncestryDNA with 355 cM shared. The MyHeritage match turned out to be my half-aunt on my maternal grandmother’s side and the AncestryDNA match was my half-first cousin on my maternal grandfather’s side, so each match identified one of my mother’s birth parents! My aunt told me that my mom’s birth father and grandmother came and took the baby from her and told her to stay away! She said the family knew about my mom and they would celebrate her birthday and keep her memory alive in the family. Tragically, according to my aunt, my maternal grandmother died heartbroken over losing her daughter. Bittersweet discovery, but finally some answers. It turns out that while Nancy's DNA was in all the databases, her aunt had ONLY tested at MyHeritage. She explained, "I was bored one day from surgery and I started looking into it. I bought my kit, sent in my DNA, and the rest is history! I have never done this before. I am so glad I did -- LOOK. We found each other, Mija. I am so happy." She further explained her main goal in testing was to confirm Native American ancestry. It is difficult to predict why a person might test in one database and not another – even the smaller ones. Get your tissues out for this beautiful story of sisters, Morgan and Jennisara, finding each other. These recent success stories have convinced me that for those searching for close biological family members, if all else fails, it is time to give MyHeritage a try. Thanks to the company's offer of free raw data uploads it will cost nothing to do so and the small effort may pay off handsomely. You just never know who it sitting in that database waiting to be matched to you, or who will test there next week or next year. It is worth the effort to make sure we are covering all the bases. If you are looking to break down more distant genealogical brick walls, you may also want to consider uploading your raw data while it is still free. Please note, however, that at this time there seem to be issues with the matching algorithms, so I would approach the matches with caution. (Of course, any close family matches like the ones in the story above should be very reliable due to the ease of detecting/predicting these.) For those researching more recent European roots, I believe MyHeritage DNA will continue to grow in importance due to their appeal to testers outside of the United States. Best of luck with your searches/research and I would love to hear about any more MyHeritage DNA success stories in the comments below. Great real life stories. Thanks for sharing - I'm glad MyHeritage has entered the DNA space and will pull for them. Firstly, I would suggest uploading your kits now because at some point MyHeritage will no longer supply free matching. Matching is free forever(!) for those wo upload now. As for other MyHeritage services such as records search or premium family site - they will still require a subscription but it's not relevant for the DNA matching. MyHeritage matching algorithm is constantly improving and the DNA database is growing fast, so you are constantly expected to get new, more accurate matches. So why wait? A couple of days ago I personally tested the upload process (Uploaded my raw DNA results from a 3rd party vendor) and it took 2 days to get my first 26 matches. This is what you should expect too (A couple of days). 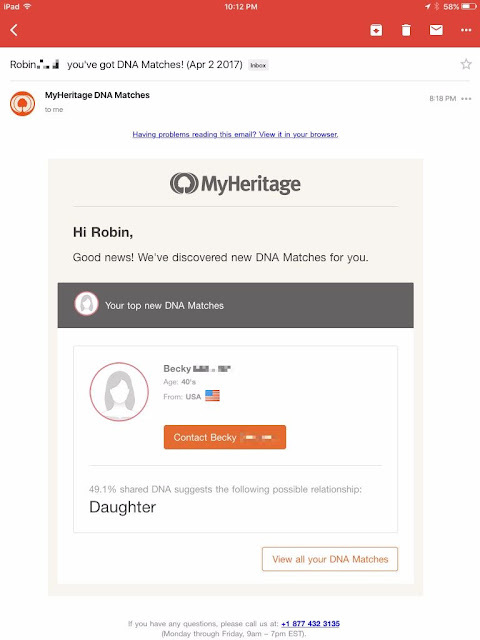 In addition, MyHeritage will soon have a great added value for all the users who upload/ed DNA kits from other vendors. Don't try to guess, just upload yours. It's very easy, it's free, and your data is 100% safe and secure. I am a MyHeritage subscriber and continue to enjoy the features of this site. I have encouraged several friends and family members to use their DNA test also. Very good site! CeCe, I recently was able to determine the biological father of a "new" cousin who Ancestry was predicted was a 2nd-3rd cousin. She was in fact, a second cousin who had been adopted. To make a long story short, we also determined that a half-sibling on her maternal side had, in fact, taken a DNA test. He only utilized My Heritage. I was really surprised, but agree it may be the "Fourth Pond." Some of this did bring a tear to my eye, and I can see that the database will continue to grow. However, without a chromosome browser, more distant matches are virtually impossible to confirm just by a site match. A similar problem to AncestryDNA. We need to get the message out that they all need to upload their results to GEDmatch if they are really interested in DNA matching. My results are on My Heritage and I have some close matches 3-4th cousin matches that I would love to explore! Yes, please please, we DO need to get the message out that all need to upload their results to GEDMatch (FREE!) if they are really interested in DNA matching. Folks have tested in different places; and not all of us can afford to join different sites. I no longer can even afford to continue my expanded MyHeritage tree, let alone join other sites. When I uploaded to GEDMatch, I discovered a niece; her father was adopted and never was able to get his records opened. He passed several years ago. Her dad was my half brother that I never knew existed! I always suspected my dad had other kids; he was 22 years older than my mother, and had been a successful Vaudeville performer all over the country, and a randy old man. I would not be surprised if he left even more of himself around the country. My "new" niece had tested with Ancestry DNA 4 years ago, with no relevant matches. She kinda forgot about it. I tested with 23andMe last year, nobody close other than my daughter and grandson, but when I uploaded to GEDMatch, bingo!! My niece was BLOWN AWAY, and so was I. Tears all around. So my "new" niece now knows about her paternal grandfather!! We keep hoping that someone from her dad's (my half brother!!) mother's side will upload DNA at some point! Please, frequently encourage folks from assorted testing sites to upload their data to GEDMatch!! 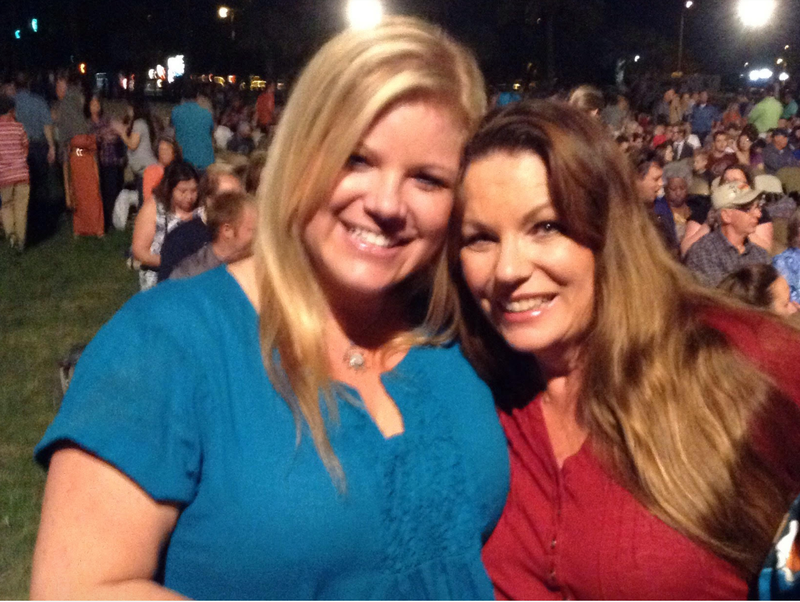 Thank you so much for letting me share it and your beautiful photo, Becky! It encourages others so much who are still searching and feeling discouraged. What joy and blessings. I WAS DEEPLY MOVED BY THIS BEAUTIFUL STORY. As they say "lost but am found". I received my DNA results from Ancestry in May 2016. Instantly I knew the named birth father was not the guy, and 52 years later, my birth mom couldn't remember a name, but had always told me there was a brief fling. Joining DNA Detectives, and learning from all kinds of people and places, I'd built out a huge mirror tree but only had 4th cousin matches and wasn't any closer until I read CeCe's post about MyHeritage being a new option, and by now it was November. MyHeritage had a 245 cm match not found on Gedmatch or FamilyTreeDNA - and within about an hour I'd solved who his birth dad was, and had narrowed me down to 3 brothers. I reached out to the easiest found one, and sure enough, he's my dad! I got my answers and a sister for Christmas, and I couldn't be more grateful. As CeCe always says, cast your net as wide as possible. MyHeritage is a great new pond, and if you have the money - test everywhere. I am unable to upload my raw data using the "You can upload here". I get a blank screen after completing the form and hitting submit. Using iMAC and iPAD. Tried 10x and nothing. Waited 10min each time in case there was a delay. Nothing. I'll just stick with GEDmatch. Jennisara is a friend of mine who I have been cheerleading through this process. I got to see part of this reunion in person and it was as amazing and moving as you would expect from that video. Just like you say, the fact that they matched on MyHeritage really struck me as showing us that it's an important new pond. Genetic genealogy has been a huge help to me in my own more straightforward research. When I do match adoptees, it is so great to be able to share these stories to help give them hope. When I go to upload my DNA file, I get the following message: Feature not available DNA tests are not available in your country. I don't get it. I live in the USA. Even my profile has USA as my country. Does anyone else have this problem? Good news! I was able to find a work-around. I created a separate profile for the DNA. At some point, I will merge everything together. I have over 100 matches on Gedmatch greater than 15cM. I took your advice Cece and uploaded (easy in contrast to some of your respondents) but 2 days later still awaiting first My Heritage match. However, reading another comment, I must be patient! Now got 28 matches, 20 from USA, rest UK/Australia (I am English), 3 already known. Pleased, worth the effort(thanks Cece), but usual problem of no reply! The other surprise was that on entering an outline tree, matches with other trees were shown, most of whose administrators were known to me: in fact, got the info from me. My own full personal details were shown too, which prompted a telephone call and they assured me that only matching tree owners could see my details. The main disappointment was that to view other interesting looking trees, you have to subscribe, unless the tree is from a dna match. Further to my previous comments, I now find that the three known matches on MY all agreed with previously known cM etc. However, a new MY match gave some 17cM match which when the tester uploaded to Gedmatch, downgraded to 5cM. A significant and worrying disparity. I just did an experiment where I uploaded a second copy of my DNA file from FTDNA to my other tree on MyHeritage. Naturally, you would expect identical or near identical results from two identical files. The file uploaded May 2016 has 31 matches, and the file uploaded May 2017 has 19 matches. nearly all of the 19 matches are also part of the 31 matches, but with very different cMs and number of segments. I think its fair to say that apart from one and two step relatives, MyHeritage DNA is just about worthless. It is now 12 months since I first uploaded and I am yet to learn anything about either my genealogy or ethnicity. We were so lucky, I did the Ancestry test to finally find the brother my other 5 siblings and I knew about from mom's early first marriage in 1953, the dad had taken the baby and basically hid him we now know, but he never knew anything about his mother so his daughter gave him the ancestry test for father's day last year, and then I put mine online 6 months later. And here we are now, 6 siblings together in our 40s 50s& 60s, texting and talking everyday, we love the same music, movies, have the same names in our families. 3 of us are flying to meet him in person at the end of the month for his birthday and planning next summer for the big reunion with everyone. I now have 22 new, AWESOME family members, just at the point in life when you think its just going to be more and more loss. Go for it, if you're wondering... it is the most incredible feeling I have ever experienced, besides my children's births. I hope everyone has the great good fortune we have had, best of luck to you. I am so grateful.